As a shop owner, there may be situations where you need to protect yourself and your customers from unwanted visitors. The threat of robbery or destruction of property is a real worry for shop owners, and we believe every shop owner should be able to protect their livelihood and have peace of mind that they can maintain complete control of who comes and goes through their shop doors. This is where our shop door lock solution works perfectly, allowing you to control your shop door from behind the counter. You may want your door to be locked at all times to only allow entry as and when a customer arrives, or you may prefer to have your doors open throughout the day, with the simple option of conveniently locking the door via the switch under the counter should you notice a potential threat outside. Privacy and peace of mind. 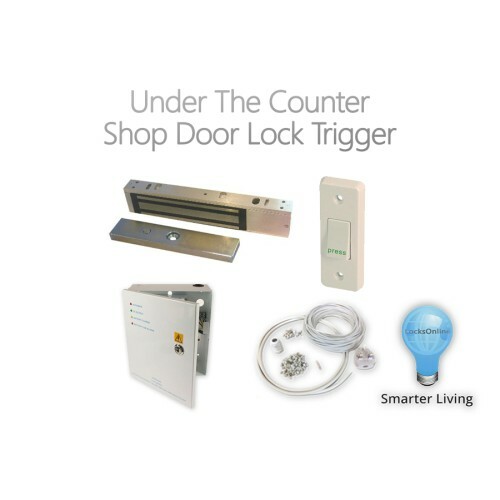 The shop door lock system allows you to conduct your transactions with privacy and security; and without interruptions. If you have a client paying in cash, or looking to take a closer look at valuables out of the display cabinets, then locking down the doors provides a safe environment for both you and your customer to do business. And with the under-the-counter switch you never turn your back or have to abandon your counter to secure the premises. With this system in place, you and your customers can enjoy peace of mind. And we know that in business, security and peace of mind are important. Protecting your business could not be easier. What type of shop can use this locking system? 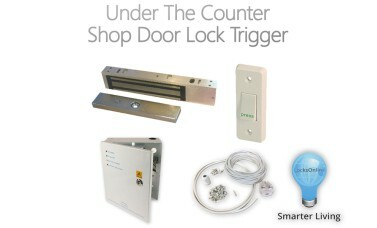 What's included in the Shop Door Locking System? Please note - this is a day-to-day operational security feature, and is not used to replace your existing locks on your doors. It is for controlling entry into a shop during running hours, and existing locks in your doors should be used when the store is unoccupied. The system must be powered down when the store is not in use so you can regain entry via your key as normal. When purchasing, please ensure you have chosen the correct trigger switch type. The lock / unlock switch allows you to switch the lock on or off whenever you choose, whereas the lock release switch is a push-switch which allows you to press and hold the switch to allow the customer in, and the door will return to the locked state once you release your finger from the switch.